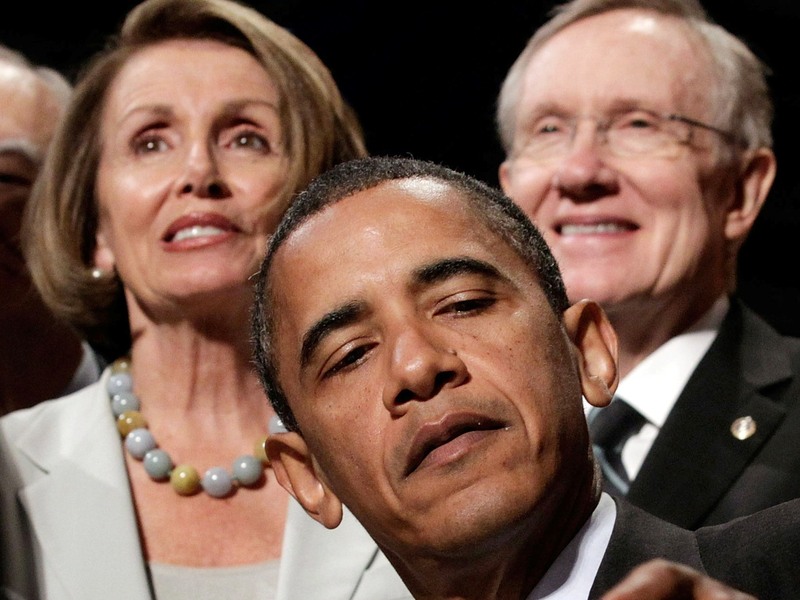 Can Democrats overcome Obamacare in 2014? 2013: Washington’s worst year in decades? Much of 2013 was a relatively good year for Democrats. Fresh off a re-election victory in 2012, President Obama and Senate Democrats, who held onto their majority, kicked off the year with a partial rollback of the Bush-era tax cuts on the highest earners as part of a larger deal to avert the fiscal cliff. A bipartisan group of eight senators wrote an immigration overhaul package that passed with a robust, 68-member bipartisan vote. And heading into fall, they managed to emerge from the first government shutdown in 17 years relatively unscathed, with their Republican counterparts taking most of the fall. The victories helped ease the pain of some defeats, including a failure to pass any gun-control legislation the wake of the Newtown shootings. But things took a turn for the worse on October 1, when the federal health care exchanges went live only to be plagued by a series of crippling tech troubles. By late December, Democrats – who had enjoyed an 8-point lead on the generic ballot ahead of the 2014 elections – found themselves down by five points. Mr. Obama and the Affordable Care Act, his signature legislative achievement, were pummeled in the polls. The president recorded his lowest approval rating ever, 37 percent, in a late November CBS News poll. The law did even worse: just 31 percent of people, including less than 60 percent of Democrats, liked it. 2014 is the time for the party to turn a page, and nothing would help more than a turnaround for Obamacare. On Sunday, the administration was finally able to announce it had passed the 1-million mark in health care signups – but that’s far short of the 3.3 million it thought would sign up. A wave of signups in the new year, especially by young, healthy Americans, would help the law’s viability, as would far fewer technical troubles with the site and more stories of people who were helped, not hurt, by the implementation. Senate Democrats, who have several vulnerable members like North Carolina’s Kay Hagan, Louisiana’s Mary Landrieu and Arkansas’ Mark Pryor up for re-election, seem set to move onto other parts of their agenda. “There's no greater challenge this country has than income inequality. And we must do something about it,” Senate Majority Leader Harry Reid, D-Nev., said at a press conference before the Senate left town in December. That will include pushing for an extension of unemployment insurance, which expired on Dec. 28 when Congress left town without paying for the program. Reid and other top Democrats also pointed to the minimum wage and student loan debt, as top priorities, and an aide said flood insurance and the farm bill were on the agenda, as well as continuing to push the House to pass immigration reform. They echo Mr. Obama, who gave a speech in early December calling income inequality and a lack of upward mobility “the defining challenge of our time.” He did not offer any new policy prescriptions, but did indicate he will renew his focus on several priorities he has already identified during his presidency: a “growth agenda,” including tax reform to close tax loopholes and end incentives to ship jobs overseas, streamlining regulations that are too costly, making further investments, and passing a budget for 2014 and undoing the sequester cuts. He also said he would work to improve college affordability, expand the availability of preschool, protect collective bargaining for unions, and urged Congress to pass the Paycheck Fairness Act, the Employment Non-Discrimination Act, and raise the minimum wage. “Issues like job creation, minimum wage, and unemployment insurance are going to weigh on the minds of voters far more than Obamacare by the time the 2014 elections roll around,” said Sen. Chuck Schumer, D-N.Y., at a press conference earlier this month. Robert Gibbs, who served as Mr. Obama’s first press secretary in the White House, warned that Democrats should take care not to overcrowd their agenda. “It will probably be imperative that next year’s agenda be somewhat focused and slimmed down on what is possible and what is probable, because a lot of it, quite frankly, just isn’t possible or isn’t probable. A lot of this stuff is not going to get through a Republican Congress,” he said earlier this month on MSNBC. House Democrats have far less leverage given their position as the minority party, but will also be pushing for items like an extension of emergency unemployment benefits, and an overhaul of the nation’s immigration laws. If House Speaker John Boehner, R-Ohio, continues to break with outside conservative groups attempting to steer his caucus, Democrats’ votes could become more important. That’s especially true on immigration, where Boehner would likely need to rely on at least some Democrats to get any legislation through the House. Mr. Obama has not given up on the issue, and his party stands to share the blame along with Republicans if nothing is done to change the existing system. As the election approaches, congressional Democrats will be eyeing between 50 and 55 Republican-held House seats, including 17 in districts that the president won in the 2012 election and 20 that he nearly won. Although the decision by Rep. Jim Matheson, D-Utah, to retire will almost certainly cost them a seat, strategists see opportunities in seats of Republican Reps. Frank Wolf of Virginia and Tom Latham of Iowa, who also announced recently they would not be running for re-election. The list of legislation Democrats in Congress hope to pursue will dovetail with the way they plan to frame the election. “We think that the election will be an election where at the end of the day in November 2014 a voter going into the voting booth asks themselves, 'who’s on my side'?,” said Emily Bittner, a spokewoman for the Democratic Congressional Campaign Committee. "I think you will see Democrats pushing for solutions and focusing on strengthening and expanding the middle class, that is what we want to give voters in 2014. But Bittner also said Democratic candidates need not run away from Obamacare. "One of our strongest arguments is that we want to fix and improve the law where they want to repeal it,” she said. “I think that we are in a very, very different place than we were in 2010 or 2012 when it was sort of this nebulous thing that people didn't know about, and now people don't want to see their benefits repealed." All of that, of course, depends on the law’s favorability numbers improving – which will only happen if people are happy with their new insurance options, prices and care. Problems at home aside, 2014 is a year where Mr. Obama’s foreign policy carries big risks with potentially big payoffs. His negotiators are still working to fashion a long-term deal to scale back Iran’s nuclear program after coming to a six-month interim agreement. Still, lawmakers – including Democrats – are threatening to impose additional sanctions, which could undermine an agreement. Then there’s Syria, where a civil war rages on that presents serious risks if the U.S. should get involved. Al Qaeda and other extremists have joined the forces fighting against President Bashar Assad’s authoritarian government, which could present a complicated mess if they take over the country. The U.S. was recently forced to suspend aid to Syria in December after extremist rebel groups captured a warehouse that contained U.S. supplies intended to reach moderate rebels. Negotiating these challenges presents yet another minefield for a president who has his hands full at home.